As someone who leads with Introverted Feeling (aka “Authenticity”) Al’s preferred mental process is one that’s concerned with inner harmony. As such, he makes decisions based on what feels right to him. As I’m sure many INFPs can attest, this isn’t an easy or straightforward way of figuring things out. It involves a life-long process of checking in with oneself, figuring out who you are, and finding the right way to navigate an often confusing world. 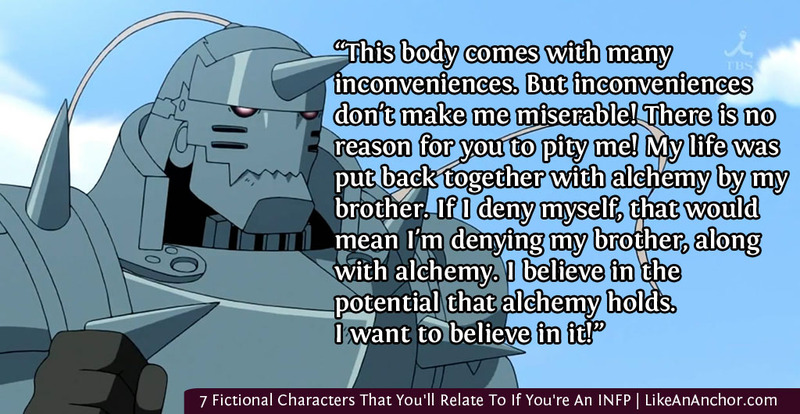 Though he’s trapped in a giant suit of armor, Al is quite a young character and though the course of his story we get to see him working through a complicated process of discovering himself that I think many INFPs can relate to from their own growing-up years. 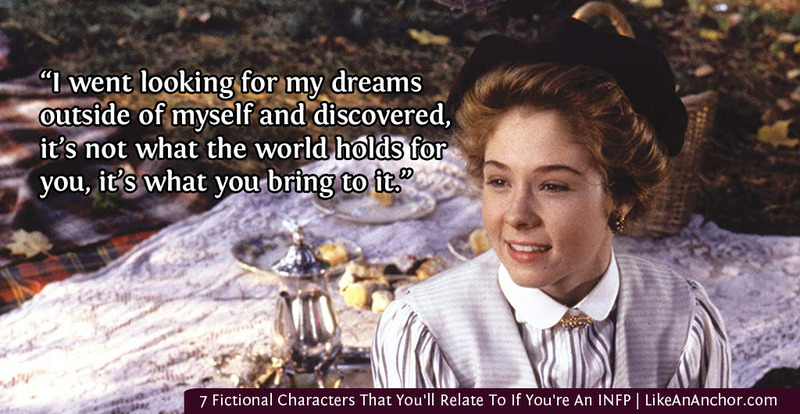 You’ll often see Anne Shirley from Anne of Green Gables typed as an ENFP, but I’m pretty sure she’s more of a talkative INFP. Anne seems much more interested in the world inside her head than in the real world, especially when she’s young (which makes sense if she’s most comfortable with the Introverted side of her personality and hasn’t fully developed her Extroverted side yet). Either way, Anne is proof of why NFP types are so often described as imaginative dreamers. The combination of Introverted Feeling and Extroverted Intuition makes for a highly individual and creative way of looking at the world. Anne often puzzles the people around her with her vivid imagination and by the depth and creativity of ideas she shares. 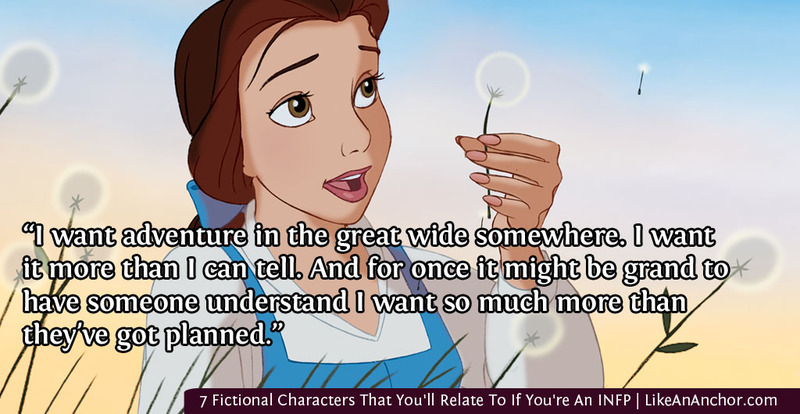 Like so many other INFPs, Belle from Beauty and the Beast places a high value on internal harmony and is more concerned with her inner moral code than with external expectations. Her Introverted Feeling is a decision making function that is deeply in touch with her own personal feelings. FPs make decisions based on an internal sense of right and wrong, as Belle does when she offers to take her father’s place as the Beast’s prisoner and then later when she defends the Beast to the villagers. As an intuitive, Belle is interested in abstract patterns and conceptual ideas. Intuitives only make up about 30% of the population and, assuming that translates into the world of Beauty and the Beast, it’s no wonder she seems out of place and “odd” to the villagers (as does her father, who’s probably an INTP). INFPs use Extroverted Intuition, and Belle perfectly models why it’s nicknamed “Exploration.” She can’t just stay locked up in her palace room or stick to Cogsworth’s tour — she has to see what’s out there and push as many buttons as possible. 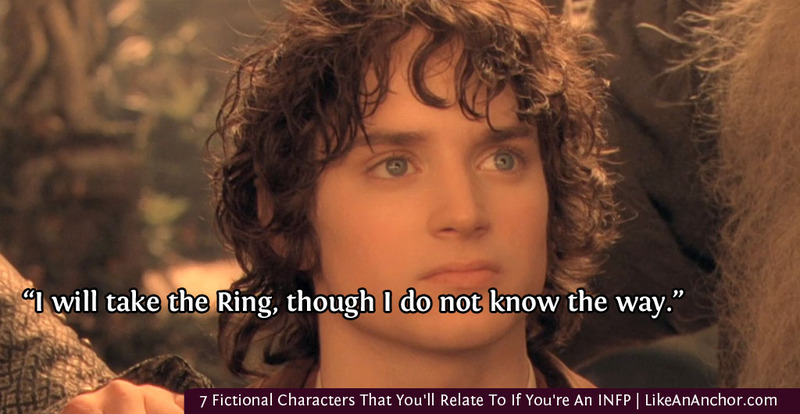 To quote blogger Susan Storm’s post about the The Greatest Movie Heroes of Every Myers-Briggs® Personality Type, “Frodo Baggins embodies the kind-hearted, soft-spoken generosity and imagination of the INFP.” Like many INFPs, Frodo is an introspective dreamer who’s also deeply loyal to his friends and doesn’t hesitate to reach out and connect with others. The combination of Extroverted Intuition and Introverted feeling also makes INFPs (like ENFPs) interested in championing causes, healing conflicts, and bringing the world into a state of goodness. Jamal Malik, the main character of Slumdog Millionaire, is a “hopeless romantic” type of INFP. In spite of all the terrible things he’s lived through in his life, he doesn’t loose hope in the power of love or the importance of relationship. He’s also imaginative, creative, persistent, and kind with a great sense of humor. Staying true to himself and to the people he loves is the most important thing to him. He even goes on the “Who Wants To Be A Millionaire?” game show not because of the money, but because he hopes the girl he loves will be watching and that they could reconnect. While I’m sure many non-NF types would call Jamal impractical, I think most NFs (and especially INFPs) will see him as a relatable character. I’m at something of a loss as to how I can sum-up Luke Skywalker in just a couple paragraphs. My post about him on my other blog, Star Wars Personalities, is over 2,400 words long. He’s such a perfect example of an INFP hero. And since we get to see his arc over a 3-movie trilogy, plus check-in on him again about 30 years later in The Last Jedi, Luke gives us a wider picture of an INFP’s journey than we get from most other fictional characters. One of the things I love about Star Wars, especially with the addition of The Last Jedi, is that we get to see characters struggling with flaws in ways that are uniquely personal to them. 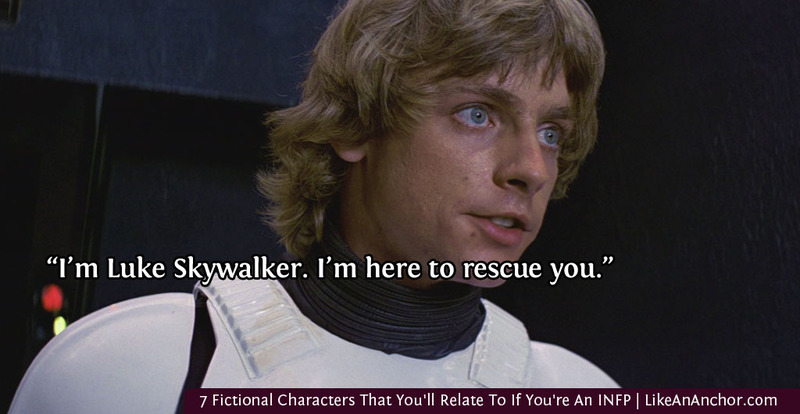 INFPs aren’t immune to “dark side” influences and impulses any more than the rest of us, and we get to see Luke’s reaction to that as well as what he’s like at his best and most heroic. 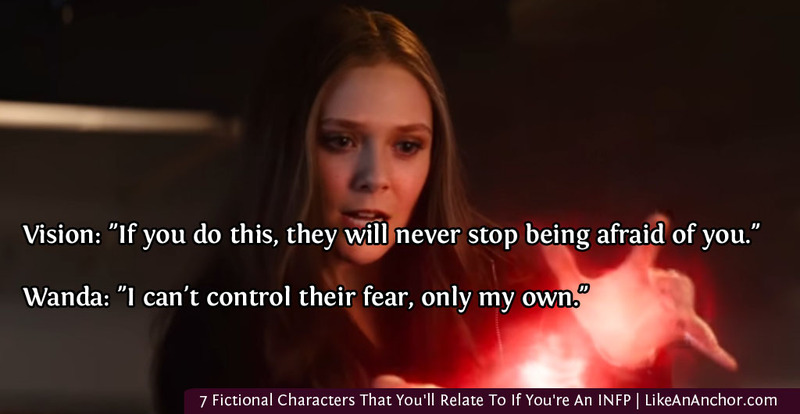 I like including at least one superhero on these types of posts, and for this one we have Scarlet Witch. Her character isn’t all that well-developed in the Marvel movies, but it seems that the comic version is an INFP as well (click here for an article on that). Her ability to manipulate reality seems like a very NP sort of power, since Extroverted Intuition is all about Exploring the outer world and figuring what makes it work and how it can be manipulated. Like many INFP, Wanda is a creative, unique, and people-oriented individual with strong personal values. Her personality and experiences give her the perspective and desire to understand other people, no matter how strange they seem. And she can use that ability against others (if they stand in the way of what she thinks is right) or to connect with them (as she does when falling in love with Vision). What did you think of this list? 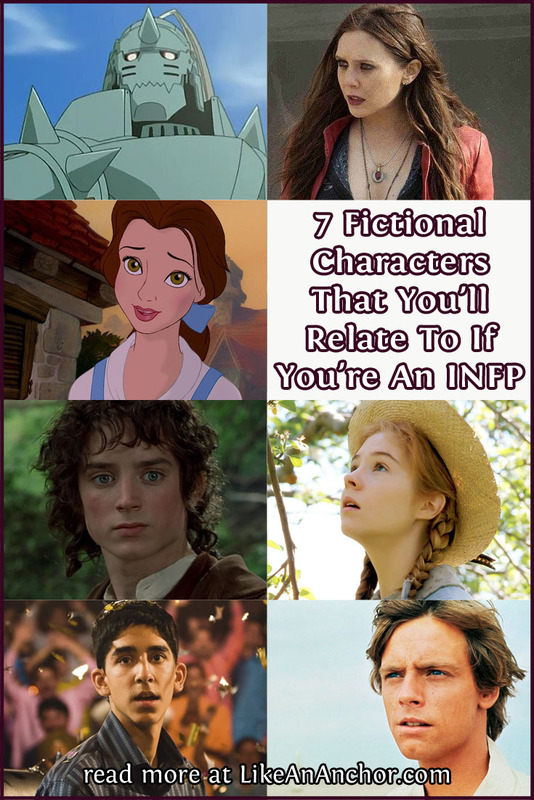 If you’re an INFP, which fictional characters do you relate to best? Is there anyone you’d add to or take off of this list? I’d love to hear your thoughts!